Editors Note – augmented reality will be a big thing in the next few years, the guiness book of records are the first to really push the technology, with the help of your android phone or iphone you can enjoy the records in full 3D. When I was a kid, comic books cost a quarter, Atari made video game consoles and personal computers — not just software — and the Guinness Book of World Records was a thick paperback book with a bunch of black and white photos of people with gross, three-foot long fingernails. A copy of the 2013 edition showed up earlier this week, proving that it’s not just technology that’s changed over those years. Even a large, hardcover book can be updated to make trivia more interesting and incorporate your iOS or Android device to make those paper pages seem a little less static. Don’t worry, not everything has changed — the fingernails are still there (pages 74-75). Guinness World Records 2013 Augmented Reality app screen capture by Brad Moon. Like so much of this early foray into 3D and augmented reality entertainment, the ratings for the Guinness app are pretty much evenly split between five stars and one star with not much in between — you’ll either think it’s cool or “meh.” I found it was a little picky about what angle the camera need to be at in relation to the pages before it would launch and the animation wasn’t anything special; some bits like the one pictured above were decent enough, but others were a little crudely done with jerky animation (at least on the iPhone 4 I used). This feature would be enough to spike some interest in kids who are increasingly expectant of such things, but it’s limited to only a half dozen instances through the nearly 300 pages, so I wouldn’t be looking at this as adding an immersive new element to the experience. That being said, my 10-year olds were on this book pretty quickly, sitting together on the couch and flipping through the glossy pages. Largest concentration of observatories: Mauna Kea in Hawaii with 13, including the world’s largest infrared and submillimeter telescopes. Furthest distance from Earth traveled by humans: 248,655 miles by the Apollo 13 crew back in 1970. Largest collection of Superman memorabilia goes to Herbert Chavez of the Philippines with 1,253 Superman -related items (to go along with his extensive Superman -inspired plastic surgeries). The Library of Congress in Washington DC (Serials and Government Publications Division) holds the record for having the largest collection comics in a museum, with over 100,000 issues covering over 5,000 different titles. The most successful merchandise franchise in movies? Yeah, it’s Star Wars . The augmented reality Guinness World Records 2013 is intended as a bridge between old-school paper books and modern content consumption. It’s packed full of glossy pictures, graphs and pop culture references, with app tie-ins and a handful of 3D features (for those with supported camera-equipped devices). For those who still prefer to leaf through a book, this should provide you with the ammunition needed for a Cliff Claven-esque level of trivia mastery. If you’d rather see your world records in a purely digital format, well there’s an app for that too. Wired: Layout with lots of pictures and info graphics is highly appealing to kids; covers a wide range of topics (not just the bizarre) including pop culture, space travel, sports and engineering; augmented reality and bonus chapter apps are free. 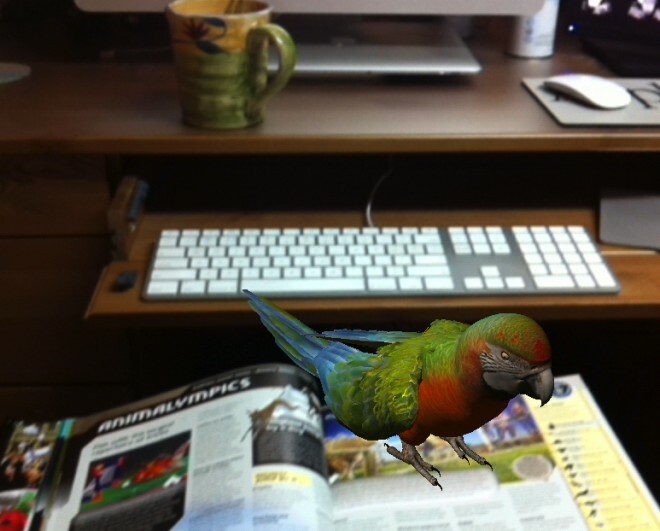 This entry was posted in Computers and Technology and tagged AR books, Guinness World Records 2013, what is augmented reality. Bookmark the permalink.